We Brits eat our way through £290 million or 700,000 tonnes worth of carrots every year – that’s approximately 100 carrots per person. Each year 22 billion seeds are planted in Britain, producing around 100 carrots per year for every member of the population. The total area in Britain planted with carrots each year is 9000ha – double the size of Holland’s carrot production area. That’s 2000 times bigger than the roof area of the new Wembley Stadium or the equivalent of 18,000 football pitches. Scientists have estimated that by the year 2015 carrots will be the new fuel of the future with 6000 carrots needed per mile. The World’s Longest Carrot was grown by Joe Atheron from Mansfield Woodhouse, Nottinghamshire in 2007. The carrot was measured in at 5.84 metres, over 19 foot long. The World’s Heaviest Carrot was grown by Peter Glazebrook from Newark, Nottinghamshire in 2014 and weighed 20 pounds (9.07 kg). If you laid all the carrots grown in this country in one year end to end they would reach 2.3 million kilometres – that’s two and a half return trips to the moon. 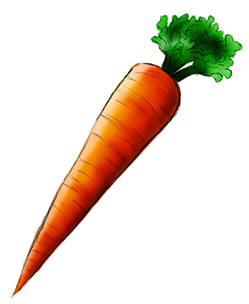 The ancient Greeks called the carrot “Philtron” which is derived from the word philein “to love”. They used it as a love medicine to make men more ardent and women more yielding. According to Asian tradition whereby foods are classified as yin, yang or neutral, carrots are regarded as a yang food, known for their tendency to warm the body, tighten muscles and speed up movement.